If you caught my vanilla cake recipe post last week, you may remember that I was feeling a little vanilla about vanilla. After all these years, my love affair with vanilla cake had grown tired and stale. 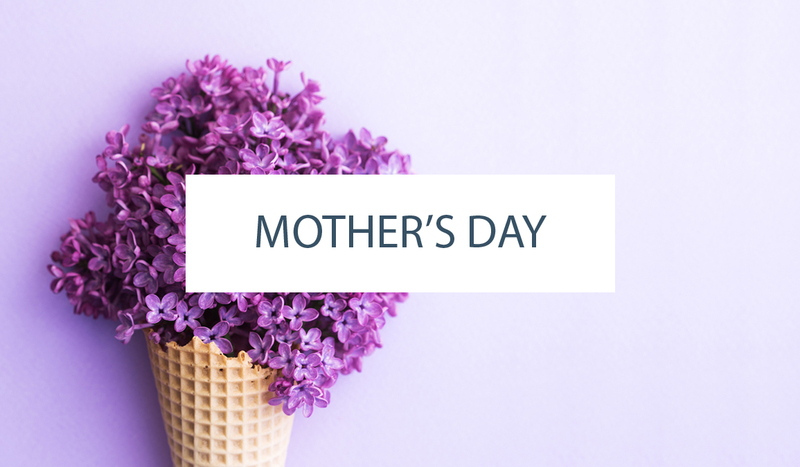 Just like any relationship going through a rough patch, we needed to zest things up a bit! So I put everything on hold and spent some serious quality time with this recipe. And I’m happy to report that today is a new day for vanilla cake. 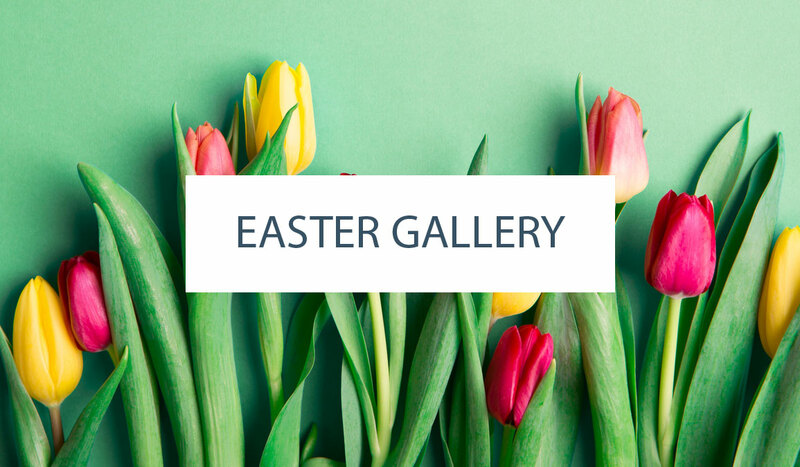 One that is fresh, bright and oh-so-delicious. 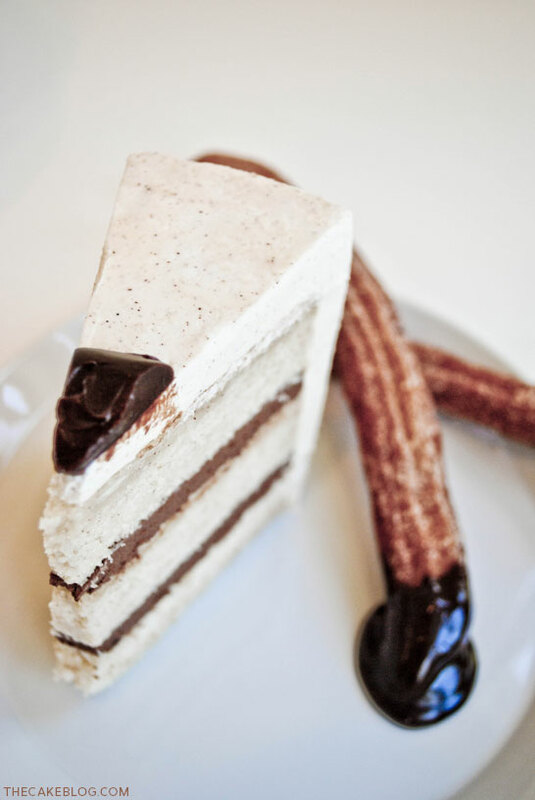 Even a tad spicy… it’s a Spiced Chocolate and Churros Cake! A vanilla cake recipe that was once somewhat simple and routine is now… sassy and spicy! 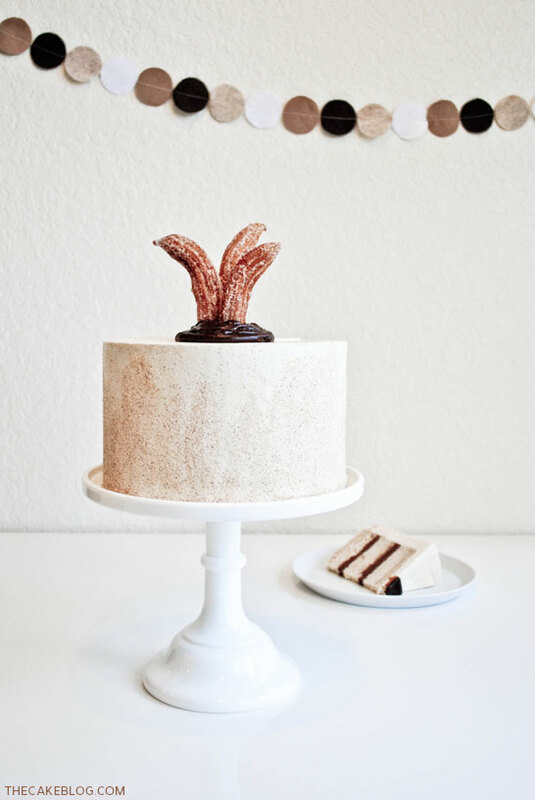 With the help of a classic Spanish donut, this cake is now full of fun and churro-inspired flavor. We start with the same exact vanilla cake recipe but then heat it up a few notches. A spiced chocolate ganache is infused with cinnamon and dried chipotles and then whipped into a smooth chocolate filling. It is subtle, smokey and delicious! You could literally find yourself eating this chocolate all on its own. Not that I speak from experience or anything. It’d also be delicious melted and drizzled over vanilla ice cream. Okay, I digress into spiced chocolate bliss. Let’s get back to this cake…. The vanilla buttercream icing is enjoying an added pinch of cinnamon and then an extra sprinkling of cinnamon sugar. Yes, the outside edges are coated in cinnamon sugar. I know, I know. Like there’s not enough sugar in cake already. But this extra coating is very churro-like and just delicious! Preheat oven to 350. Prepare three 8″ round pans with butter, parchment and flour. Stir vanilla bean paste into buttermilk. Set aside. In the bowl of a stand mixer, beat butter and sugar on medium-high using the paddle attachment. Cream until pale and fluffy, about 5 minutes. With the mixer on low, add egg whites one at a time. Mixing well after each egg. Add one third of your dry ingredients and mix just until combined. Add one half of your buttermilk. Mix. Alternate ingredients again. Dry, wet, dry and mix gently. Do not over mix. Divide batter between the three prepared pans. Bake 30-33 minutes, rotating pans once. Cake is finished when a toothpick comes out clean. Cool 10 – 20 minutes before inverting cakes from pans. Cool completely before assembling cake. Wrap with plastic wrap and refrigerate if not using until tomorrow. Chop chocolate and place into a medium mixing bowl. Set aside. Combine cream, cinnamon sticks, chipotle peppers, vanilla bean, salt and pepper in a medium saucepan. Bring almost to a boil over med-high heat. Reheat again, almost to a boil. Pour cream through a fine mesh strainer onto the chocolate. Discard contents in strainer. Let cream and chocolate stand for 10 minutes without stirring. Stir to combine the cream and chocolate until smooth, shiny and glossy. Let ganache cool to room temperature. Reserve about 3/4 of a cup of ganache for the top of the cake. Beat the remaining ganache with a mixer on medium-high for about 2-4 minutes, until slightly lighter and fluffier. This is your spiced, whipped ganache filling. NOTE: If ganache is not whipping up nicely, pop it into the refrigerator for 10 minutes and mix again. In bowl of stand mixer combine egg whites, sugar and salt. Place over a pan of simmering water and whisk continuously until temperature reaches 160 on a candy thermometer and the sugar is dissolved, about 3 minutes. (The mixture should feel smooth when rubbed between your fingers). Attach bowl to mixer fitted with the whisk attachment. Starting on low speed and gradually increasing to medium-high, whisk until stiff peaks form and mixture is fluffy and glossy, about 10 minutes. Your bowl should no longer feel warm to the touch. With mixer on medium speed, add butter a few tablespoons at a time, mixing well after each addition. Continue mixing until icing is smooth and silky, about 10 minutes. Add vanilla extract and cinnamon. Mix until well combined. Note: If your icing looks curdled after adding the butter, continue mixing and it will return to a silky smooth texture. If it is too runny, simply refrigerate it for a few minutes and then mix it again. Layer your vanilla cake with the whipped ganache filling and stack. Crumb coat and ice the stacked cake with the cinnamon buttercream icing. Once shaped and smoothed to your liking, gently coat the sides of cake with a sprinkling of cinnamon sugar. 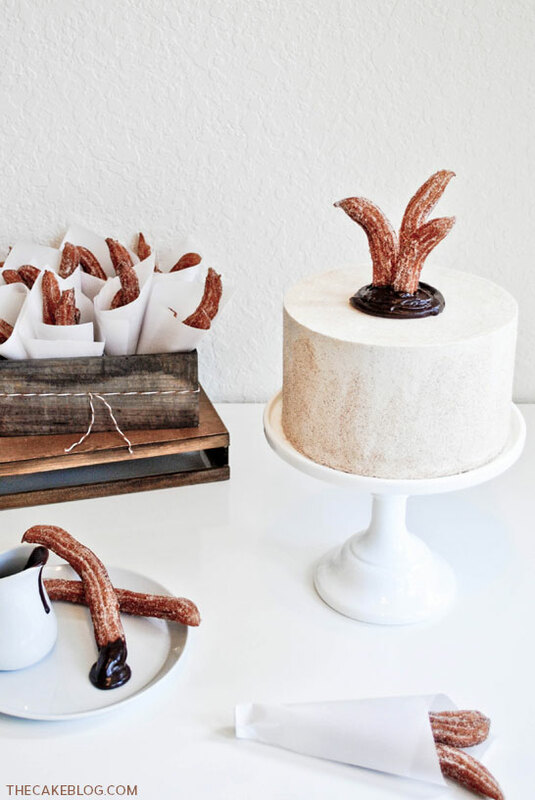 Adorn with churros, if desired. 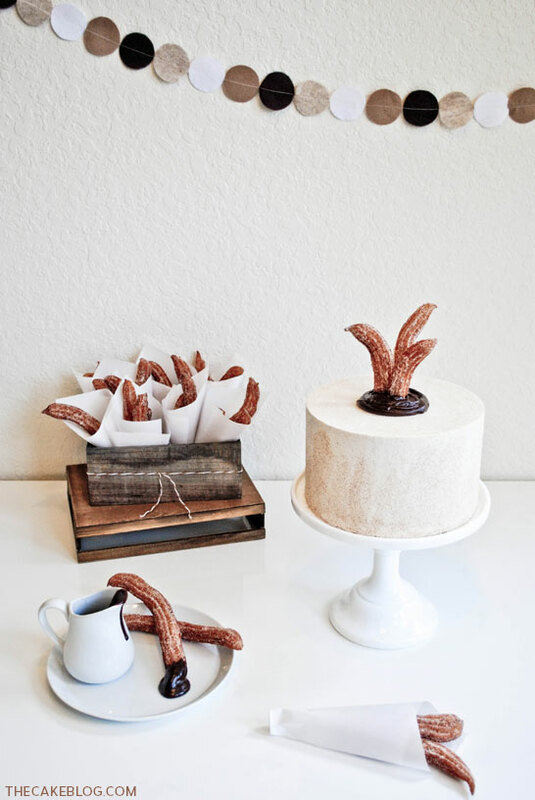 Note: I am not a churro-making expert but tried several recipes when making this cake. I chose this one HERE for the cake. 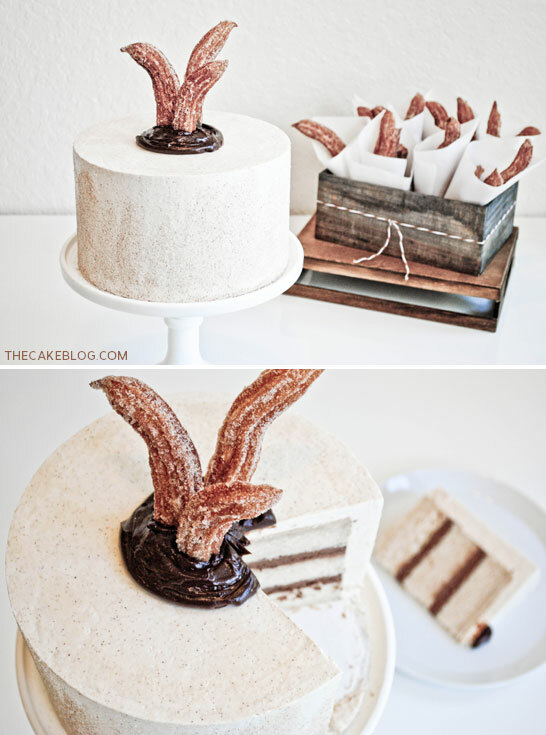 I hope you give this Spiced Chocolate & Churros Cake a try! It is muy delicioso and exactly the little kick that my vanilla cake needed! Thank you! I hope you give it a try. Cinnamon and chocolate… such a warm flavor combination! Oh wow, this is amazing! 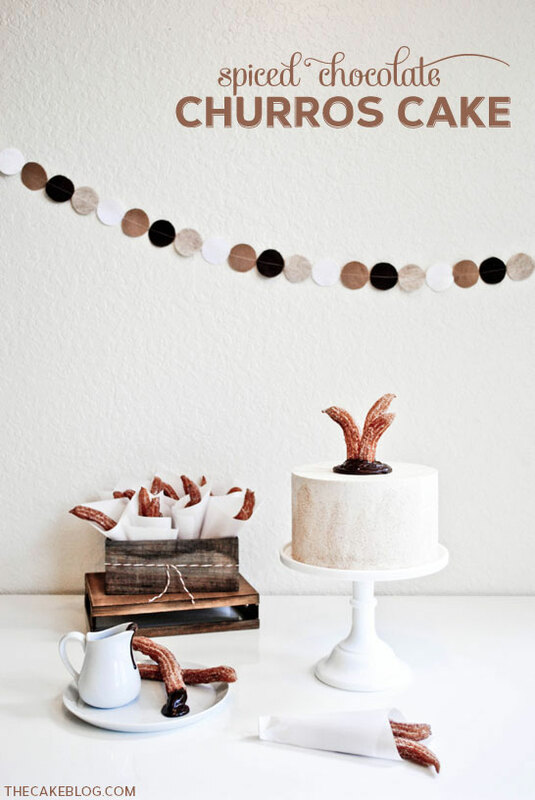 Such a great original idea and your cake looks stunning! Your cakes are absolutely gorgeous! This recipe sounds fabulous– I’ll have to give it a try very, very soon. Perhaps Cinco de Mayo? WOW! Now this is my type of cake! I love cinnamon. So beautiful and must be so delicious. I make cakes constantly but I’m in awe of how straight your sides are!! Have you tried to make this using Mexican Chocolate instead of semi sweet? This cake looks so good, but I am so scared to use recipes that do not use oil. I love moist cakes and I have never made a cake with butter that was moist. Any advice? Churros are my favorite! Wow! I just made the frosting and the ganache. Amazing! This frosting is so amazing that I am pretty sure I can never have another kind! I made the ganache without the chipotle peppers and pepper. It’s awesome! Truly inspired by you today! Thank you for your recipe!